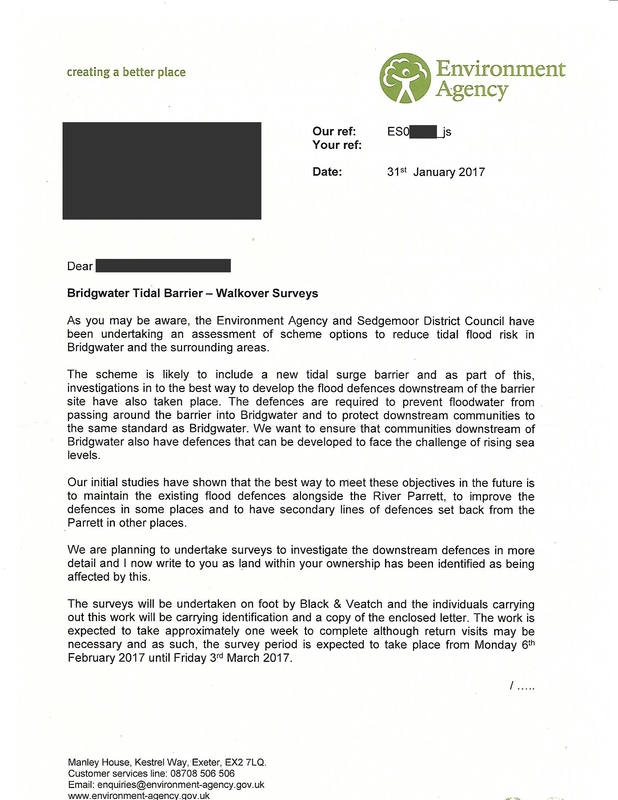 The existing Bridgwater Tidal Barrier scheme has a flaw. Water can go around it. Any system including a flood defence system is only as good as its weakest link. The banks of the River Parrett is the Achilles heal of the EA’s scheme. 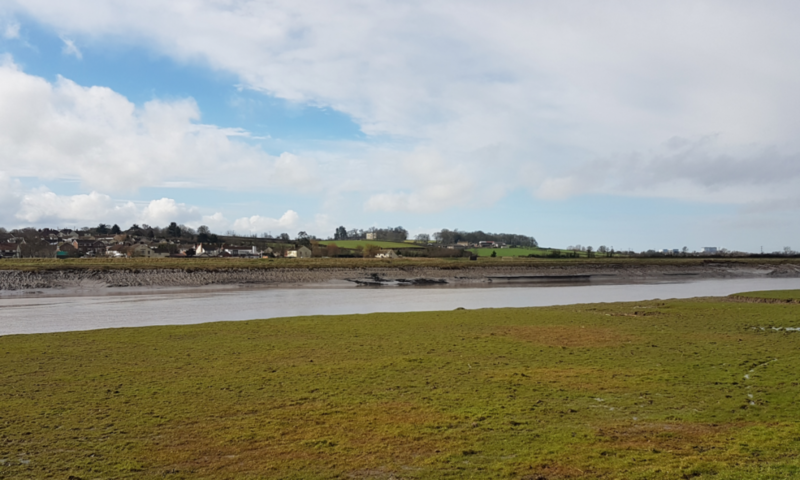 The ground along the river is simply too weak to support the continued raising of the river banks and from the EA’s point of view too expensive to maintain. The Parrett’s highest tides hidden behind the raised banks are already at the top of the doors of Bridgwater’s houses along the A38. 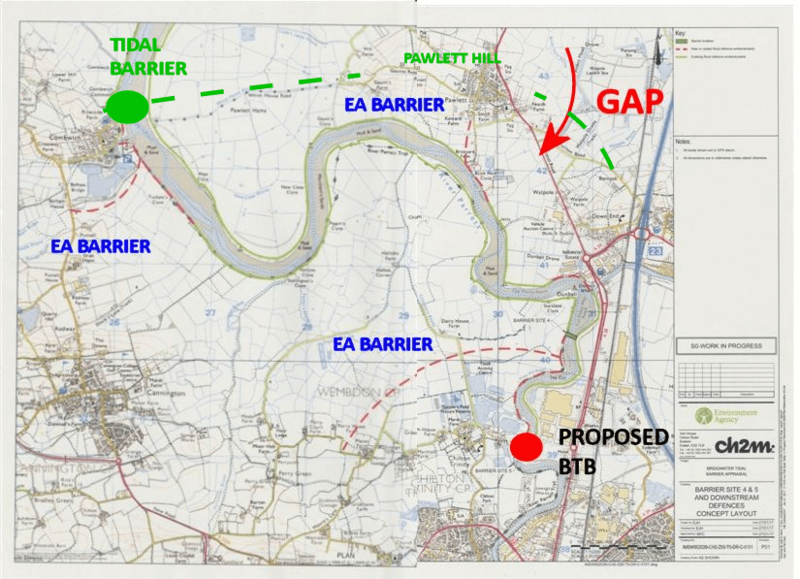 Even before it’s been built and the complete scheme revealed to the public the EA is working on adding secondary flood banks (dashed red lines) on the premise of a bank failure or a future decision not to maintain the existing flood defences. The drawing below is a scheme the EA has to fix the flaw. The red arrow is the open back door at Walpol where a breach to the north could circumvent all the defences. When the Dutch build a dyke they don’t build another one a few hundred metres behind it; clearly the EA expects a failure to occur or the river to over top. The line in green is an option never considered by the EA but one that would offer much better protection than what is being proposed. This is information never presented to the public in any of the consultations in 2016. To my knowledge Bridgwater will have the UK’s only tidal surge barrier not located at the mouth of the river it’s meant to control. At Bridgwater’s present rate of expansion the proposed barrier will in 100 years time not be just near the centre of Bridgwater but within the centre of its developed area. Only in Somerset would anyone come up with the plan we have and think its acceptable to have a scheme that has such an obvious flaw. Let’s also not forget that the EA’s other wider site downstream is being reserved for a road bridge to land that the EA is not protecting in the same way as existing housing. What happens when that is to be developed? Start again? The ratepayer should have had real options presented rather than the EA’s version of the Henry Ford motto “any colour you like as long as its black”, ie anywhere in the river as long as its at the narrowest part of the river we can persuade people to accept. 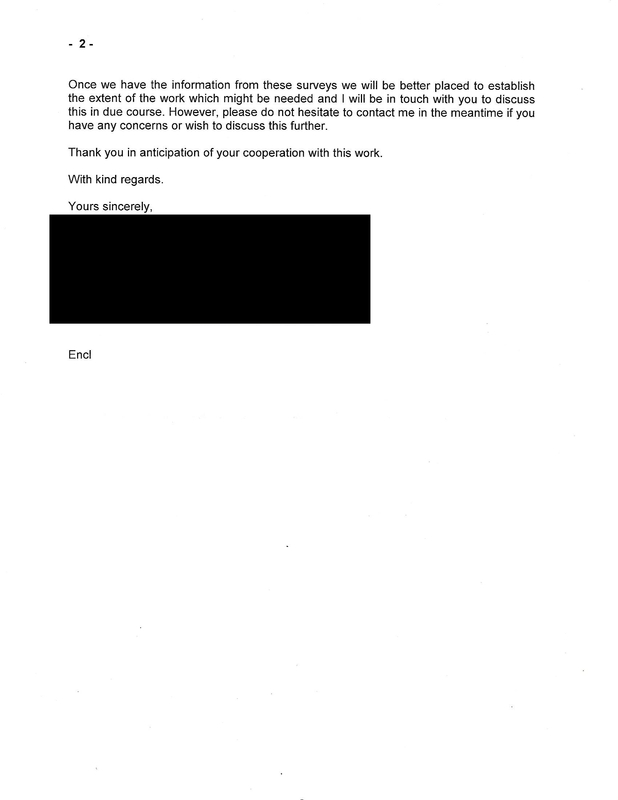 The letter below confirms that the barrier can be circumvented. Previous PostPrevious Why things go wrong.